Thanks to Pink Blush for providing me with product in exchange for my honest review. All thoughts shared are my own. Looking for a go-to holiday look this season? I don't get too into dressing for holidays. I like to be festive, but don't like to dress in anything that's over the top or that will hinder me from being able to accomplish my daily tasks and responsibilities. I need cute. I need easy. I need trendy with a hint of glam, and I need to be able to work it into my limited budget for fashion fun. That's a pretty tall order, but I have found an adorable holiday look that I love and am excited to wear this holiday season. 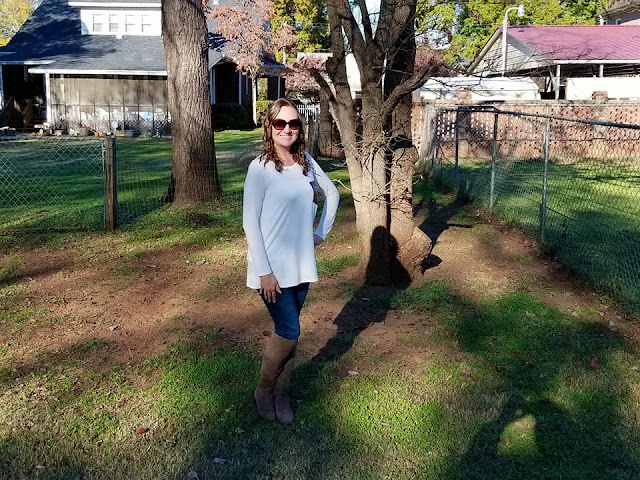 PinkBlush is well-known for their gorgeous maternity fashion, but did you know that they also have a line of women's clothing, aside from their maternity/nursing line? I found Pink Blush when I was pregnant with Baby S, and loved their gorgeous maternity apparel. I wound up purchasing several pieces and loved wearing them throughout my pregnancy. Last Christmas, I shopped PinkBlush for my mom and sister. Their women's clothing line had some fabulous holiday deals, and I snagged some beautiful pieces for two women I love dearly, at amazingly low prices! 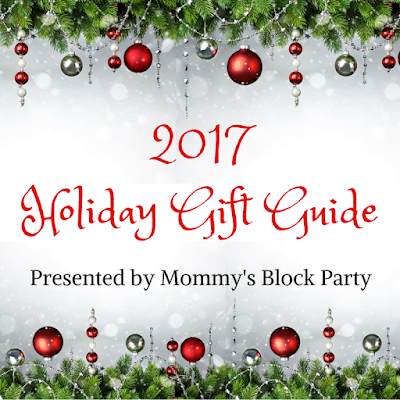 This season, I'll be doing the same- looking for fabulous fashion finds and glam pieces to add to my wardrobe, as well as fabulous gifts! A fun and casual fall look with a hint of holiday glam. I'm wearing the Ivory-Sequin Pocket Top from PinkBlush. This little beauty has become one of my favorite pieces this season. I usually steer clear of white because, well- I have kids... enough said. I do like to wear white tops this time of year, though. It's such a clean and fresh look, and then I can play pieces up or down with other pieces, such as vests, long necklaces, etc. What I love about this top, is how easy it is to wear it. It looks great just styled with a pair of jeans and a pair of boots, and not much else. I've worn this cute top for running errands, and I even wore it for a photo shoot with my local newspaper. We were working on a holiday-themed story, and I thought this top would look great in the shot, with the glam sequined pocket giving that extra 'oomph' in my outfit without being overstated. The top comes past the hips, so if you're really bold, you could certainly wear it with leggings or jeggings. As we get closer to the holiday season, I plan on pairing it with wine colored ponte pants and black booties to kick up my look to another level. PinkBlush makes it so easy to achieve the effortless boutique style I crave. I love their incredible selection of tops, especially, as well as tunics and dresses. They also have a wonderful selection of shoes and accessories! My closet is filled with beautiful pieces from PinkBlush for good reason- they're quality boutique apparel items that last. Plus- I am still wearing some of my maternity and nursing styles dresses and tops, even after losing *most* of the baby weight. Their maternity styles are so trendy, they wear like non-maternity clothing and still look great well after baby arrives. I plan on wearing the sequin pocket top to the Holiday Caravan Parade next week, and also plan to wear it on Christmas Day when we make the rounds visiting family and friends. It's got just the right amount of holiday sparkle! Want the look? Get it! Head on over to PinkBlush to browse all of their gorgeous styles! Get glam this holiday season with a little PinkBlush, or better yet- why not give glam to friends and family? 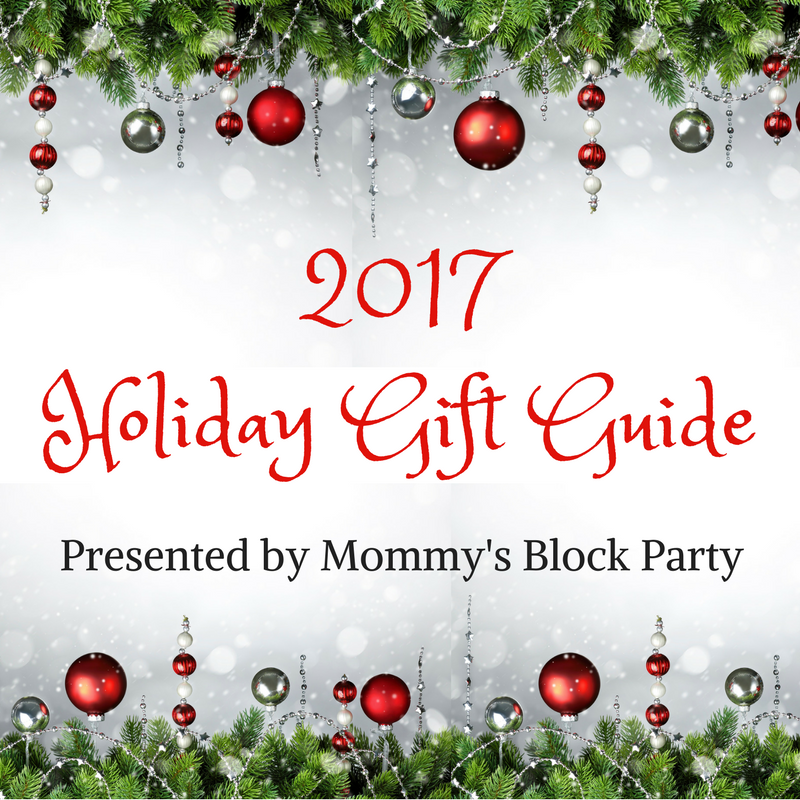 Shop PinkBlush for perfect holiday gifts! New customers receive 10% off their first order when they sign up on the PinkBlush site. Connect with PinkBlush through Facebook, Twitter, and IG. Want the look? Win it! 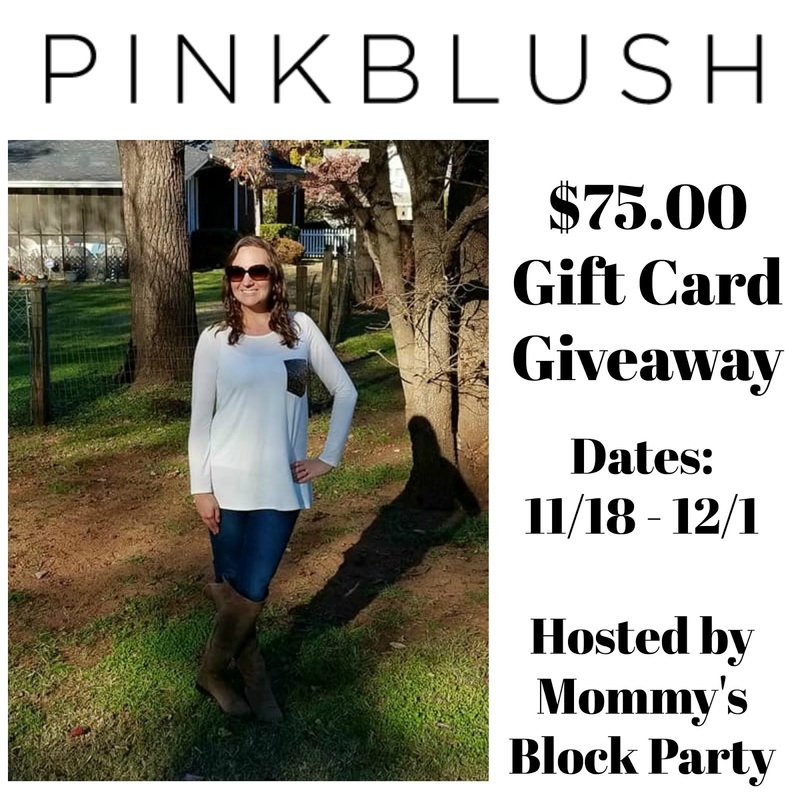 One super lucky MBP reader will win a $75.00 PinkBlush Gift Card! 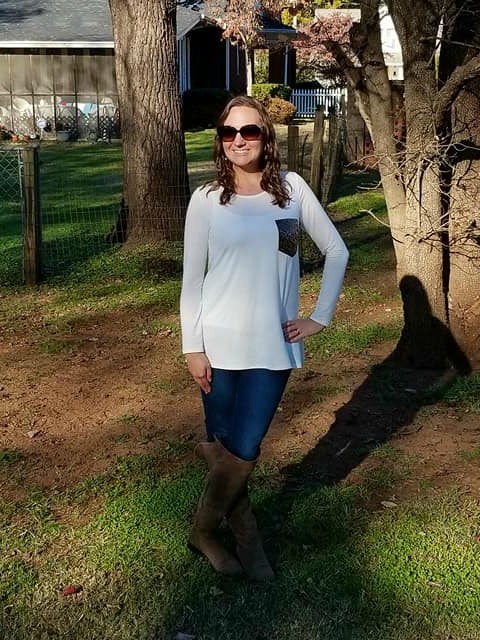 Special thanks to PinkBlush for allowing me to share about their beautiful boutique apparel and accessories and for providing a giveaway for our readers. I would get the Olive Off Shoulder Maternity Top and Grey Hooded Lace Trim Maternity Sweater. I love the navy lave neck maxi dress, and the black lace accent top! I really like the burgundy jumper. I don't know if I could pull off the look though! I love the black lace off shoulder dress for the holiday and the Blue Soft Knit Lounge Pants for the cold winter season! 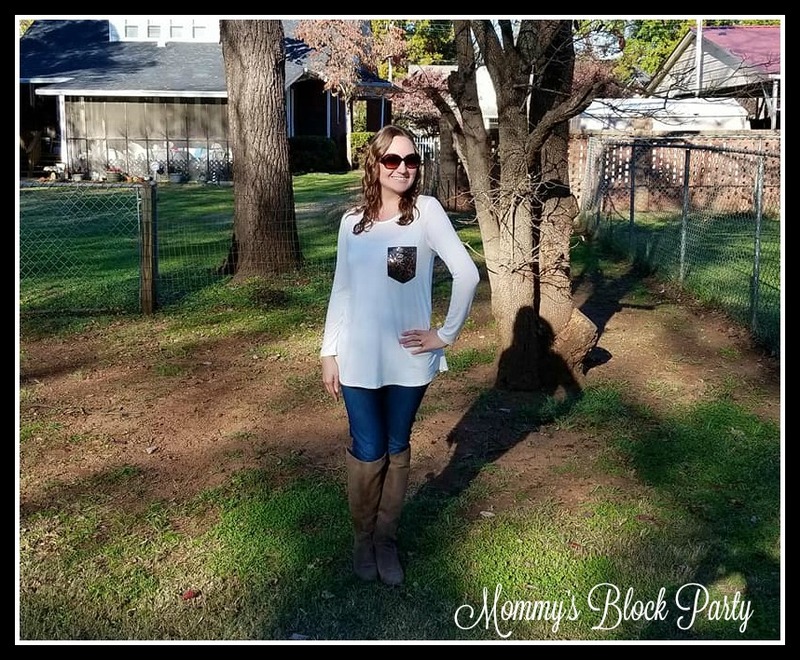 I love the Charcoal Solid Scoop Neck 3/4 Sleeve Plus Top. I also like the Black Draped 3/4 Sleeve Plus Maxi Dress. I also like the Light Blue Crochet Trim Lace-Up Plus Tunic. I love the Purple Crochet Overlay Sweater. I also like the Rust Hooded Lace Trim Sweater. I also like the Charcoal Heathered Crochet Hemline Knit Plus Dress. I would like to have the Burgundy Lace-Up Sleeve Top. I would get the Pink Crisscross Sleeve Sweater. Isnt the Navy scalloped dress beautiful! The Black Velvet Floral Overlay Wrap Jumpsuit is gorgeous! It would be perfect for holiday parties! I would like to add the Purple Crisscross Front Long Sleeve Top to my wardrobe. I like the pink floral pj pants! The Burgundy Embroidered Mesh Long Sleeve Top is GORGEOUS! I love The Black Draped 3/4 Sleeve Plus Maxi Dress. Thanks for the chance to win such an amazing giveaway.